Buy Best Backlink Checker Tool! To check the backlink status of users (advertiser) website pages on the publisher website an alert user if web link is not found. It is well known that Backlinks are important for your websites page rank. Data Doctor’s Backlink checker software provides convenient way to check the users (advertiser websites) back link status on to the various publisher websites. Backlink checker utility sends an immediate alert notification to user defined E-Mail id if advertiser page cannot be displayed or website link is not found on the publisher site. Back link checker software helps to analyze the quantity of the link status of websites factor responsible for the website popularity for business purpose. Link checker tool is capable to detect links including java script link, link on publisher’s website or mutual advertiser website link etc. Link checker tool find the website link status and generates the report in TXT or HTML Format for further reference in perfect and quick way. 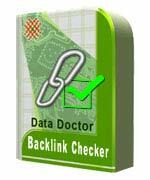 Backlink checker utility checks the linking status of advertiser websites onto the publisher websites. Link checker sends an alert notification to user by an e-mail if advertise link is not found on publisher site. Link checker detects the link including java scripts, link on publisher websites or advertiser website link. Back link checker tool generates the report in CSV file format for future use. Software is affordable and easy to use tool for technical and non-technical users. Software is helpful for business purpose by checking the status of web sites. Software supports windows based operating system, 128 MB RAM and 20 MB free hard disk space for the fully installation of software.